We hate to say it, but those visions of sugar plums aren’t dancing in your head anymore. The holidays are over. The presents have been unwrapped and some have been returned. The visits to friends and relatives have stopped and even all the leftovers are gone. Traditionally, holiday decorations are supposed to come down on either January 5th or 6th, but let’s face it, a lot of people haven’t taken their decorations down and we all know that family that still has their decorations up until Memorial Day. At Box&Co, we know it’s difficult to get motivated to put those decorations away, but we’re all about making storage easy and we want to share a few ways that you can make your post-holiday storage less of a chore and get those decorations packed away, so you can begin the countdown to holiday season 2018. The most popular type of holiday decoration can also be responsible for some of your most difficult storage problems. If you use a real tree, you simply have to follow your local sanitation guidelines to dispose of it, but an artificial tree can take up space. This Old House recommends getting a rolling case for your artificial tree. They also suggest that you don’t dismantle the tree if you can avoid it. There are tree bags with rolling bases available on the market. Your next step will be to take care of lights and ornaments. The best way to store your lights is to keep them untangled. 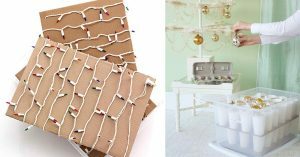 Martha Stewart’s website suggests organizing your lights by winding each strand around a piece of cardboard. That way you’ll be able to store each individual strand separately in a plastic bin. It’s also not a bad idea to label each light strand with information about where they were hung the previous year. When packing away ornaments a good practice is to use an ornament container that allows you to pack away the ornaments individually in separate compartments. This will help prevent them from being damaged or break while they’re packed away for the winter. Stewart suggests using a separated cardboard box and does not recommend using plastic bins because they can trap moisture. Finally, it’s time to pack the decorations away. And the key last steps involve organizing. You want to be able to find every ornament, piece of tinsel or ginger bread house when it’s time to find it again next year. So you’re going to have to keep track of where you put everything by putting together an inventory. Then you’re ready to ship them off. That’s where Box&Co comes in. When you’re ready to store your holiday decorations, place an order with us. We’ll bring you storage containers so you can start packing your items and creating an inventory. Then schedule an appointment to have us come and pick up your items. You can keep track of your inventory online and when you’re ready to get your items back, log into your account and schedule a delivery date. It’s that simple. To get started contact Box&Co today. This article lists tips and tricks for storing decorations after the holiday season, including how to store an artificial Christmas tree, safely storing lights and ornaments, and more.